Hello, my name is Allan Davies and i operate AD Celebrant Services. I have lived in Andalusia, Southern Spain for almost ten years, emigrating from the United Kingdom, and currently based in Malaga on the Costa del Sol. 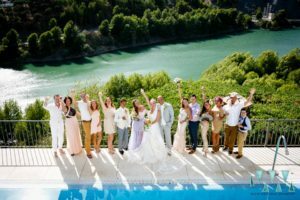 I cover and can travel all round Spain to conduct and direct your big day. My background was mostly in military service as an instructor, after which I become a popular public speaker in schools, colleges and other organizations helping people with public speaking and confidence building. Celebrant Blessing Ceremonies are growing more popular every year. I have carried out and officiated at many ceremonies as an experienced Celebrant, MC and toastmaster. Whether it be same or mixed gender ceremony, whether 2 or 200 guests I am able to perform your Wedding Blessing Ceremony, Toastmaster and MC services, Vow Renewal Ceremony or your Commitment Ceremony in Spain, I have covered areas from Almeria to Nerja, to Malaga to Benalmadena costa and Pueblo, Mijas Costa and pueblo, Puerto Banus, Torremolinos, to Estepona, San Pedro onto Cadiz and then inland to Ronda, Seville, Cordoba and Granada, but willing travel anywhere to make your special day. With over 20 years experience, your ceremony will be bespoke and perfected down to every last detail, each and every ceremony is different and completely your way. I thrive in making your day as perfect as possible. 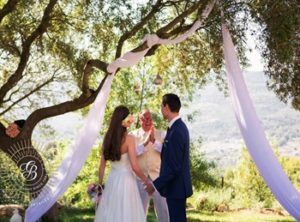 I take pride in providing you, and previous weddings I’ve conducted, with an affectionate, tailor-made and professionally delivered ceremony that you, your family and friends will cherish forever and beyond. Please take a look at and read my testimonials from very happy brides/grooms/wedding parties and guests. As an experienced and well travelled person, I have conducted many ceremonies including religious, secular and humanist blessings and services, i will always accommondate to your wishes, whether they are religious or not. In many parts of the world I have delivered ceremonies that have engaged me, eg Egypt, South America, North Africa, European countries and at different venues from riverbanks to the top of mountains and with very different settings, from the traditional hotel, hall and formal venues, to beaches, cruise boats and private yachts, swimming pools and beaches, in fact anywhere you want or can have your ceremony, I can be there! 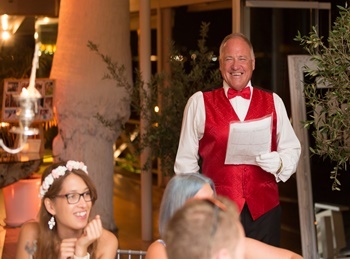 I have also many years experience and am well qualified as a Toastmaster and MC (Master of Ceremonies). I am a very adaptable, outgoing, intimate, fun and flexible person with the confidence to communicate at all levels which has been a key feature in my Celebrant and other ceremonial tasks, ultimately providing him with a wide range of experience over the past 15 years. This has lead to my ability to conduct ceremonies for mixed religions and non religious persuasions, same and mixed genders, as well as Toastmaster and MC duties. I find the work extremely stimulating and count myself as a very fortunate person to be involved in such a happy occasion and profession and i simple LOVE what i do and the people i meet. 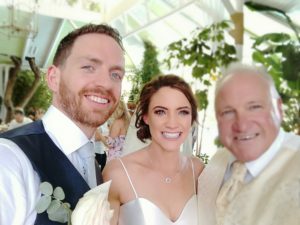 I am also conversant in popular Invocations and secular graces, and as a true professional providing a totally confidential service, I am a non smoker and never drink alcohol on the event day. And it doesn’t stop there! Planning a wedding isnt just about booking a celebrant and saying a few words to one another, i have been lucky enough to have met many people and have established great relationship with photographers, videographers, musicians, cake makers, florists etc so I’ve dedicated a page on this website (“links”) especially for you with my recommendations to make your planning just that little bit easier.